Over the last few years we’ve been the lucky receipents of a Playmobil Advent calendar thanks to our role as a #PlaymobilPlayologist. My favourite was the Playmobil Santa’s Workshop Advent Calendar although my 5 year old loved the Playmobil Pirates Treasure Cove advent calendar. 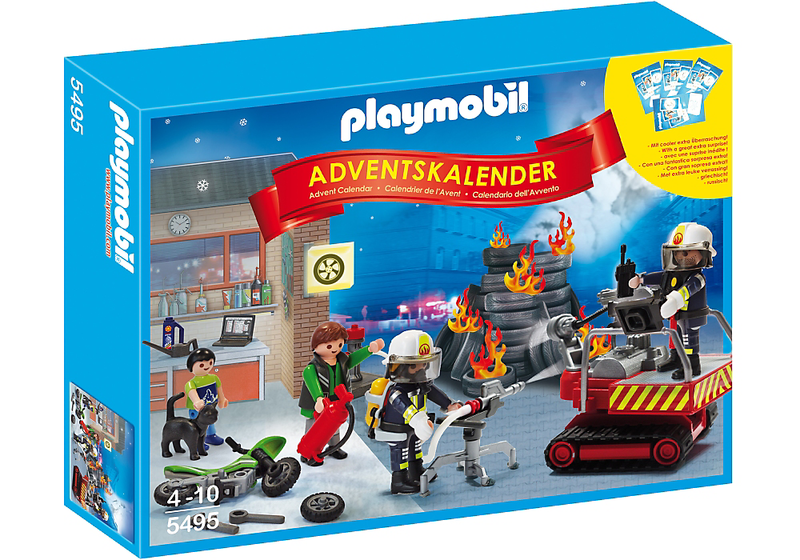 I’m a bit of a traditionalist when it comes to Christmas so I admit I was a tiny bit disappointed when we received the Playmobil Advent Calendar Fire Rescue Operation with Card Game 5495 to review. There’s a fire in the motorcycle workshop (diorama)! Every second counts: As quick as lightning the firemen with their giant extinguishing-robot and their special equipment are present and fight against the flames. Race to the rescue and put out the fire! The Advent Calendar “Fire Rescue Operation” with Card Game contains twenty-four surprise items for each day leading up to Christmas. Once all the pieces are revealed, pull out the card game for some extra fun! Includes backdrop, four figures, fire vehicle, water hose, fire extinguisher, bike, and other accessories to create a blazing fire rescue scene. The Advent Calendar comes in a large box with protective sleeve, the cardboard backdrop is slipped inside. There is a box for each day of Advent and there are a couple of different sized boxes. You can see the contents on the sleeve of the box, so I will be removing this before I put this in our Advent Box for the children to open on December 1st. The contents are varied but build up to a really great scene to play with. We don’t have any Fire Rescue toys from the City Action range but there are some great new playsets in this range and this would go really well with them. Don’t forget to check out our post about the new Playmobil Special Forces Fire Fighters which celebrate the 150th anniversary of the London Fire Brigade. 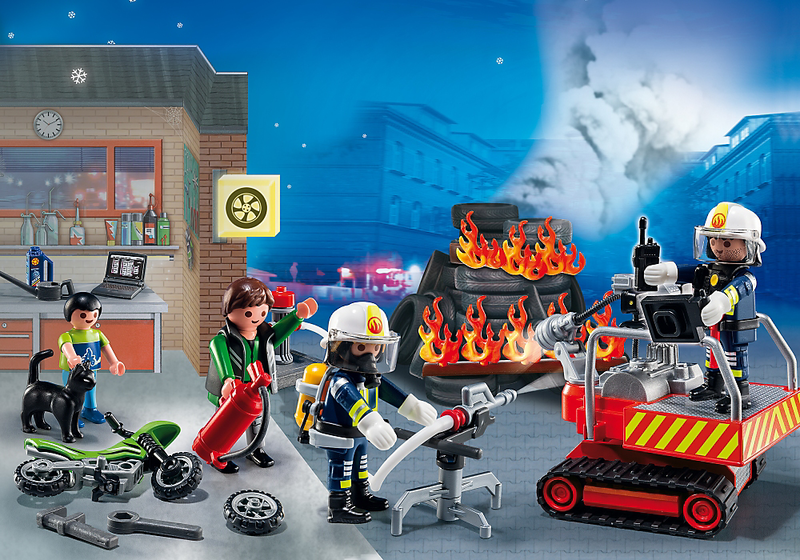 The Playmobil Advent Calendar Fire Rescue Operation with Card Game 5495 has a RRP of £19.99 and is available to buy online from Playmobil and other good toy shops.